Roots: Origins of Doctor Who. Pinocchio. The Lion, the Witch and the Wardrobe. Juliet Bravo. Intertextuality: Red Dwarf was nearly not made as 'no one watched science fiction on TV'. Double Entendres: ...well, the whole story, pretty much. 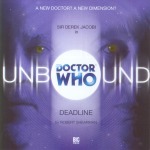 Continuity: What if...Doctor Who never got made? In 1963, a children's programme 'Doctor Who' was proposed, but was never made (possibly due to the thought that no one watched science fiction on TV). Consequently, no science fiction TV was ever made (Sydney has never heard of the concept, so clearly no Star Trek, etc.). Martin Bannister was commissioned to write the first script for the show, but when that fell through, he ended up writing fourteen scripts for the show 'Juliet Bravo', a successful show about a policewoman. The first story he wrote was 'Burglary Most Foul'. 'Juliet Bravo' inspired an offical magazine, and many unoffical ones. Martin's scripts for Juliet Bravo are regarded as the worst of the series. Martin Bannister was nominated one of the ten young writers to Watch (he was number seven) by the Times in 1961. He had three wives (the first, Mary, and the second, Amy, the third isn't named), and a son Philip (by Amy). He wrote several theatre pieces (some successful, some not), before turning to TV, eventually being proud of making deadlines, then being proud of not getting fired for missing deadlines. Eventually, he ended up in a nursing home. He can't remember if Sydney Newman was Australian or Canadian. For some reason, 40 years after the Doctor Who show was never produced, Martin started dreaming about it. He took on the role of Doctor Who, with a granddaughter Susan (based on Amy), and companions Barbara Wright (named after his nurse) and Ian Chesterton (named after the nurse's boyfriend, but based on Philip). They travel in the TARDIS (the word coming from the nurse's poem which referred to 'tardis blue'), which stands for 'Time and Random Destinations in Space'. After failing to get on with his grandson, Tom, Martin finally gave in to his dreams and became Doctor Who. Another cracking script from Rob Shearman. This time the best parts aren't the Doctor Who elements, but the human story. The tale of the father who lost his family whilst chasing his dreams is a moving one, and Rob Shearman creates it here beautifully with the wry touches we've come to love so much. (Not to much the not-so-subtle nods to the classic Doctor Who moments we all know.) With top notch casting to round it off, an excellent story.